Though we live in a digital age, there’s no replacing the power of books—especially in design. Not only do they tell the story of the homeowner, adding personality to a space, but they also make a bold decor statement. “A . . . book lasts as long as a house, for hundreds of years,” Thomas Jefferson once wrote. “It is not, then, an article of mere consumption, but fairly of capital.” Here, we asked two book-loving experts to share their tips for using your books as smart accessories in your home. Think about your interests. Satoh has curated more than a thousand book collections over the last two years, and she always starts the process with a conversation about book content and overall subject themes. For example, Satoh recently created a collection of Jazz Age books for a Prohibition era–themed space at a New York hotel. Commune employed built-in shelves painted arsenic green to contain books and objects in a 1930s Los Angeles house. Mix it up. 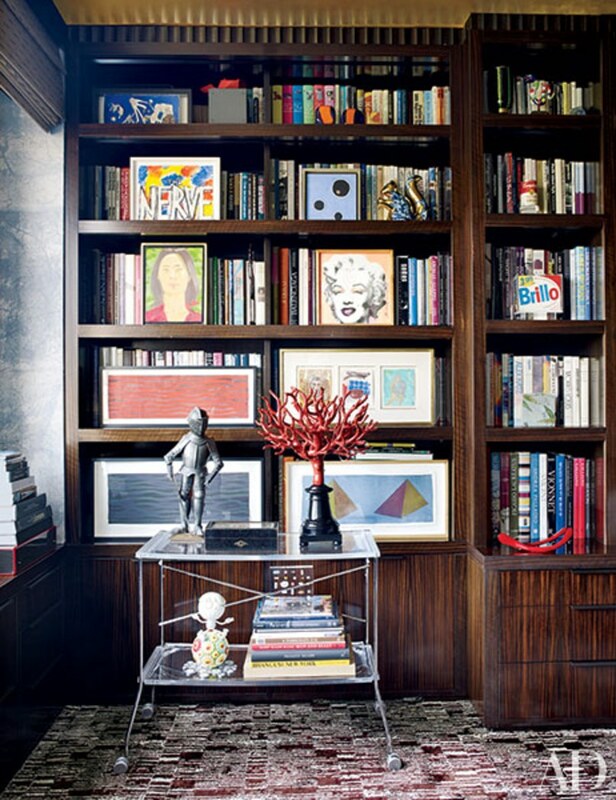 “I often mix books with my client’s other pieces, such as blue-and-white Chinese porcelain or antique tea caddies,” says De Bastiani. Interspersing books with something as simple as travel photos is a great way to subtly tell the world about you, he says. To ensure your collection still looks organized and cohesive, Satoh recommends grouping the books by color, subject, or size, then pulling the spines to the edge of shelf. Make them accessible. Special vintage copies, or even your favorite novel, should be displayed facing out on your bookshelves for extra attention, says Satoh. At your next party, showcase a tome or two on your cocktail table. “Books can be a great conversation piece,” says De Bastiani. Other easy-to-reach spots: the fireplace mantel or a large window sill, where the books will be framed by the drapery and sunlight.